Public Transit in Ottawa: Could Ottawa use a commuter ferry? Interprovincial transit is kind of a hot issue in the national capital region right now. 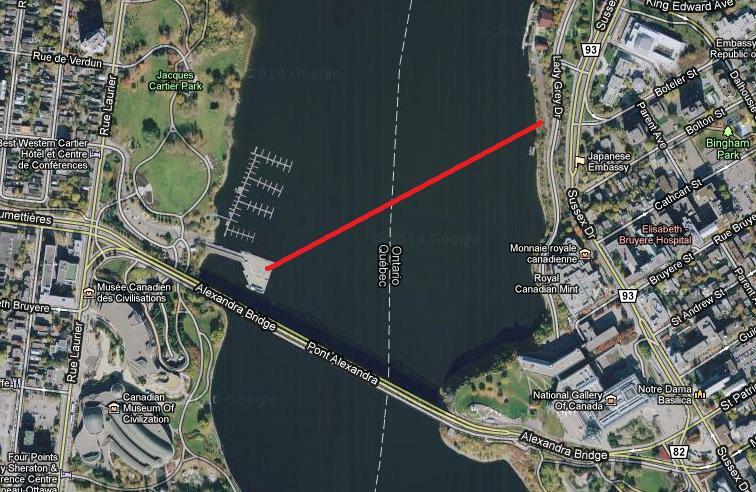 Currently, OC Transpo drives across the river into Gatineau, and STO drives across the river into Ottawa. Neither are particularly popular on the other side, but the presence of STO buses in downtown Ottawa has been an especially unpopular reality for city planners here. Add to that the fact that the interprovincial service of OC Transpo removes it from provincial jurisdiction and into federal hands, thus decreasing the possibility of an essential-service designation that some have called for, and you see that Ottawa and Gatineau have a bit of a problem on their hands. There are a few ways to prevent this bus cross-over--most popular being an LRT connection across the river--but one idea I thought would be interesting, and as far as I know hasn't yet been discussed, is a commuter ferry joining the two transit providers. 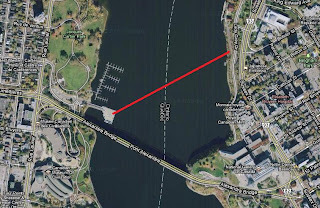 The image above is a possible route, running about 500 metres (maybe a 10-15 minute ride) between the Hull Marina and an area near the Ottawa Rowing Club near Sussex Drive. If Ottawa and Gatineau were to initiate a ferry, this seems like as reasonable a route as any. On the Gatineau side, the decision is easy. It would require negotiation with the Hull Marina, and perhaps some retrofitting of the facilities to ensure they could handle what would likely be a fairly large boat, but the marina is run by a not-for-profit management board which may be open to the possibility (although I haven't spoken with representatives to confirm this). The Ottawa side would be more of an issue, because a harbour would need to be built to dock the ferry and load passengers. The area I selected, near the rowing club around Sussex Drive, was recently discussed on OpenFile Ottawa, and development projects around there may be in the works. Those projects could include the construction of a harbour for these purposes. Interestingly, the land between Lady Grey Drive and the river is owned by the National Capital Commission; if an Ottawa Port Authority were to be established, it would make sense for the NCC to be the catalyst for it. The problem with the above image? Well, most obvious, is the fact that OC Transpo buses don't go anywhere near Lady Grey Drive; most buses will have followed the Transitway south towards the Hurdman Bridge as they head that far east. The other option would be west of downtown, near Lebreton Flats or in Nepean Bay, but that's a long haul for the ferry to run, and it would have to run along the front of the Chaudières Falls. Maybe it's not something that can happen. Maybe it can. I just think it would be an interesting and potentially effective way of uniting two regional transit utilities with a novel transportation option. That would really slow down inter-provincial transit. I can currently take several buses (some STO and some OC Transpo) directly from my home in Hull to downtown Ottawa without transferring. Having to take a ferry would slow my trip so much that it would be more efficient to walk across a bridge. I like the idea of a 3rd body to run river / inter-provincial transit crossings. However, for those that work and live west of downtown, bussing across downtown to the Rowing Club, only to bus back on the Quebec side to work at Terraces de la Chaudiere, Place du Portage, or others would extend the transit trip. How about extending the 3rd body , an NCR transit authority, that is designed to interconnect the two transit systems.? This would be a great opportunity for a subway. Or any kind of LRT. But who knows what the next millennium will bring. Seems a Gondala, o4 maybe several, at different points along the river, would be cheaper and more convenient in all seasons. Like the one linking Roosevelt Island to Manhattan. How about an aquabus like in False creek in Vancouver running from the little dock at the museum of civilization to the locks under parliment. Totally a tourist experience, but may actually be doable.